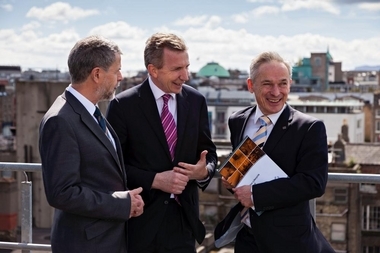 Pictured at the announcement from left was Jobs, Enterprise and Innovation Minister, Richard Bruton TD, FeedHenry CEO Cathal McGloin and Damien Callaghan, Investment Director at Intel Capital. Waterford-based FeedHenry, a provider of cloud-based mobile enterprise application solutions has secured €7M ($9M) in a funding round led by Intel Capital and it plans to create 100 jobs over the next two years, with the majority located in its Waterford and Dublin offices. The funding includes a seven figure investment from existing investor Kernel Capital. Other existing investors VMware Inc., Enterprise Ireland and private investors also participated and were joined by new investment from ACT Venture Capital. The new funding will provide FeedHenry with additional capital to accelerate the international roll-out of its award-winning cloud mobile application platform. The investment was confirmed as Jobs, Enterprise and Innovation Minister, Richard Bruton TD, and the new investors visited the Waterford office where the core research and development work is carried out in the 40-person company. The company has been supported by the Department of Jobs, Enterprise and Innovation through Enterprise Ireland and Science Foundation Ireland. 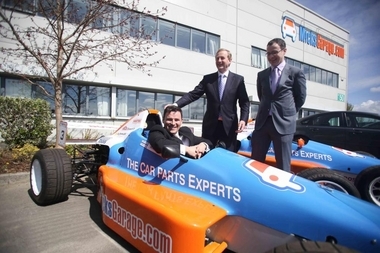 Pictured are MicksGarage.com's managing director Ciaran Crean and online and technology director Michael Crean, with Taoiseach Enda Kenny, at the opening of MicksGarage.com’s new warehouse and office facility in Dublin. Irish car parts and accessories e-commerce retailer MicksGarage.com is to create 65 new jobs over the next two years on the back of a €2.3m investment to expand the business. The announcement was made as the Taoiseach Enda Kenny opened the company’s new 32,000 square feet warehouse and office facility in Park West, Dublin 12. Founded in 2004, MicksGarage has grown to become one of Europe’s largest car parts and accessories online retailers, delivering products across Ireland, the UK and mainland Europe. 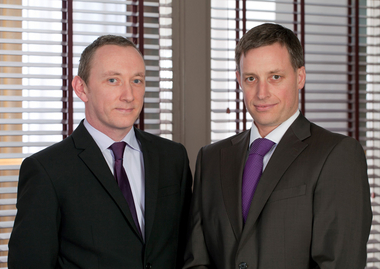 The business, which currently employs 34 staff, was set up by brothers, Ciaran and Michael Crean, from Ballina in Mayo. The €2.3 million investment was made by the Ulster Bank Diageo Venture Fund managed by NCB Ventures, the AIB Seed Capital Fund managed by Dublin BIC and private investors. It will fund the business including the roll-out of localised MicksGarage websites for nine European markets including France, Germany and Sweden. 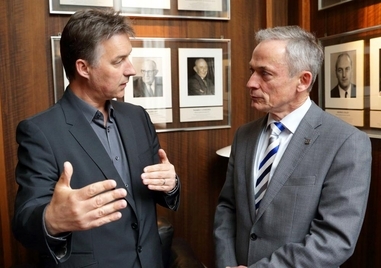 Pictured are (l-r): Michael Kelly, CEO of FINEOS with Minister Richard Bruton T.D. Fineos, the Dublin-based technology company that provides claims management software for the global insurance industry, is to create 50 new technology jobs. They will see FINEOS’s workforce grow from 350 to 400. 40 of the jobs will be based in Dublin, with the balance spread between Australia, the US, and Canada. The new positions include Java software engineers, software testers, business analysts and technical implementation consultants. FINEOS is also recruiting development and technical consultants in Poland, where it has a Software Development centre in Gdansk. The international positions reflect the key regional growth areas for the business. William Flanagan, CTO of Opensky Data Systems and Michael Cronin, CEO of Opensky. Nass based Opensky Data Systems, Enterprise Ireland supported company, is to create 30 new jobs to meet the demands of new business and predicted growth over the next two years. In addition, Opensky is accelerating its expansion into Irish and international markets. The additional jobs will now almost double the company’s current number of employees of 50, bringing the total to 80. The recruitment drive is expected to commence immediately. Opensky provides business technology solutions, CRM, business intelligence and managed software services to the food manufacturing, retail and public sector. It has grown its revenues by 100% in the last two years and forecasts growth in the region of 60% in 2013. Opensky Data Systems will look to recruit a wide range of staff, including software developers, project managers, support, sales and marketing and quality assurance personnel. Storm Technology announced the creation of 21 new jobs to fuel the growth of its business technology consultancy services. Storm Technology is a leading business technology consultancy that specializes in building solutions to help clients gain better value faster from the investments they have made in Microsoft technologies. They work with a diverse range of companies, both Irish and International, large and small and across many sectors and have offices in Dublin and Galway. The new jobs, which are supported by the Department of Jobs, Enterprise and Innovation through Enterprise Ireland, will include opportunities for senior technology consultants, experienced CRM Dynamics consultants, SharePoint and project management consultants along with roles for graduates and emerging talented software developers. The roles will be based in both Dublin and Galway.